This is a guest post by Alexander Drechsel. Alexander is a staff interpreter at the European Commission, who works from English, French, and Romanian into his native German. He shares other people’s opinions in the interpreting booth, and his own thoughts and insights on languages and technology on his website adrechsel.de or as @adrechsel on Twitter. You can also tune in to LangFM, his storytelling podcast about language and what people do with it, and Troublesome Terps, a conversational podcast about topics that keep interpreters up at night, with Jonathan Downie and Alexander Gansmeier. 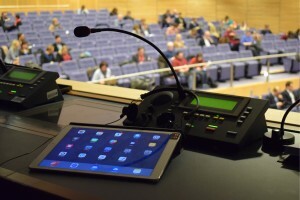 Sometimes, when people talk to me at a conference or meet-up, they’ll just address me as the “tablet guy” or the “tablet interpreter.” This is probably because I have been working with tablets ever since Apple launched its first iPad in 2010. At last count, I have owned five versions of the iPad and three Android tablets. All of those I have used before, during, and after interpreting assignments for all kinds of tasks. 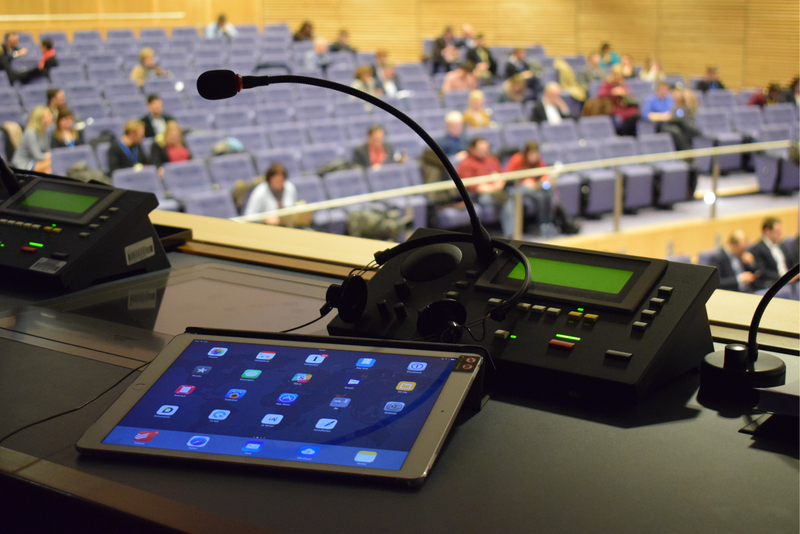 And for several years, I have helped fellow interpreters get the most out of their tablet during workshops and presentations. In the back of my mind, however, there has always been the question: What about tablets and translation? Can these devices be useful for translators? In this article, I will explore the question in more detail. – SDL Trados Studio is not currently available on tablets. You could certainly install it on a Microsoft Surface Pro 4, but that is more of a tablet-laptop hybrid. So for now, your only option to use it on a “real” tablet, would be remote access (see below). – OmegaT is a CAT tool that requires the Java runtime environment to work but Java is not (really) available on iOS or Android tablets. (Again, the Microsoft Surface would be an alternative). – MemoQ: While Kilgray do offer MemoQWeb, you need a memoQ server installation along with web licences to be able to use it. If you do, you get the translation interface, a collaborative terminology management system and some project management and administration features. – Wordfast also provides a web-based solution, called Wordfast Anywhere, and it does not even require a Wordfast licence. Free of charge (for now), it gives you a personal workspace on the company’s server for your translation memories, glossaries and other files. WFA also offers collaboration and sharing features. – Memsource appears to be the leading CAT tool right now when it comes to mobile availability. For starters, it is designed as a cloud-based solution. A desktop editing software is available, but most of the heavy lifting happens online. The recently published apps for iOS and Android are mainly intended for project managers. Now, while some CAT tools can indeed be used on tablets, the biggest problem is likely to be the limited screen real estate available. My advice would be to use an external keyboard. On Android and Windows devices, you can even connect a mouse. Getting down to business. And productivity. – Write and edit text documents. Most applications also support track changes or will even let you draw and doodle on a text. – Draw up and edit spreadsheets. Yes, they can even contain formulas or conditional formatting, if need be. – Create and edit presentations. Oh, and did you know you can also give the presentation straight from your device? Wirelessly? Another obvious use case is managing email. And no need to only do triage – with a little bit of practice on the on-screen keyboard (or, well, an external keyboard), you’ll be writing on the go like a pro in no time. And with tricks like email snoozing, mobile email clients like Airmail or Spark easily out-smart their desktop counterparts. And yes, in some regards, our mobile companions are real geniuses: Think of the camera in your tablet or smartphone. You cannot only use it for snapshots, but also to turn your device into a smart portable scanner. Apps like Scanbot leverage the device camera to help you scan one or several pages quickly and cleanly, and even offer optical character recognition. And with FreshBooks, you can not only manage clients, projects and invoices, but also “scan” paper receipts that you may need for billing a client. 1. Install the Chrome Remote Desktop extension on your Mac or PC. 2. Open the newly installed Remote Desktop app and follow the setup instructions. 3. Download the client app for your iOS or Android device and sign in with your Google credentials. 4. Choose your PC or Mac from the list of available devices and log in with the PIN you entered during setup. This may sound a little silly at first, but bear with me. With “second screen,” I’m not referring to hanging out on your favorite social network and commenting on a TV show or the game that everybody’s watching right now. Instead, it’s the use of apps to extend your main computer screen to your tablet. It works similarly to remote access: you install the helper app on your computer and the mobile app on your tablet, make sure that both devices are directly connected or on the same network and you’re good to go. If you’re curious, iDisplay is a good place to start, since it’s available for all major platforms. The luxury option for iPad users with a Mac or PC is Duet Display. 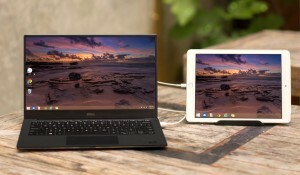 But even without such an app, you can just use the tablet as a secondary device next to your main computer, say, for research, to control the music that “gets you into the zone” for that dreaded patent translation or as reference when you are localizing an app. So when PCs are trucks and tablets are cars, maybe Microsoft’s Surface devices are SUVs? Whatever you compare them to, tablets have become mature devices that can be useful for translators, too. Why don’t you give it a try? And if you just want to grab your tablet to “Netflix and chill” – go ahead, we won’t judge you! Won’t this then give rise to potential confidentiality issues? I have clients who won’t let me store anything in the Cloud – but then I guess that’s patents for you. My experiences with this haven’t been good so far. A few years ago, I bought a Chromebook, which operates using Google Docs, or an app which you can download to work offline if necessary, because I wanted to work on the move. The app turned out to be little more than a text editor: Docs wasn’t bad, although it is missing several vital features which I need for my translation work. The trouble is that subsequent updates (which you can’t defer) a) removed the app or other more vital items without replacing them and b) have ended up occasionally locking me out of the Chromebook completely because it sometimes insists on my being online before it will log me in. So it’s all very good when the WiFi is working, but when it suddenly goes down the machine is as good as useless, as I discovered one day when travelling down the M40 and the WiFi suddenly cut out. The other disadvantage of a Chromebook is that the software is all in the Cloud, and it won’t let you install any apps of your own on the machine: there are even some electronic dictionaries that it won’t allow. Oh, and did I mention confidentiality? It has an offline mode which is supposed not to link to the Cloud at all. Except that once it did, and I found things I’d carefully been keeping offline on the Chromebook had suddenly ended up on my PC! So, not ideal. Thanks, Alison, for that comprehensive look at the issue! Very interesting about your experience with the Asus. Great tip! It will soon be applied. That’s wonderful to hear, Juliana. Let us know how it goes. Thanks very much Alexander and Corinne for the guest post. Very interesting. I implemented a second monitor for my desktop pc in addition to my laptop which I use to run all my email and as a portable pc when I am travelling (synchronised with main work pc using Dropbox). Up to now I had never considered a tablet as a second screen possibility but this could easily be another weapon in the armoury when doing work remotely. Thanks, Jason! Yes, I loved that tip too. I often travel with my laptop and my tablet, and it never occurred to me either. Let us know how it goes if you try it. Thanks for this very helpful post, Alexander! I am a very novice tablet user (and I have the world’s most basic tablet, an Acer Iconia), but your post inspired me to learn something new and incredibly useful. Printing PowerPoint notes drives me crazy: 30 pages of paper that I have to shuffle during the presentation (in this case a webinar) and that I often only use once. But I never bothered to learn how to include the notes page when exporting a PDF of a PowerPoint show, and I don’t have PPT on my tablet. After reading your post, and with a webinar coming up tomorrow, I resolved to conquer this ongoing annoyance. Learned how to export the notes (Save as>PDF>Options>Publish What>Notes Pages), then loaded that PDF on my tablet so I can run the slides off my laptop and the notes off my tablet during the webinar. No wasted paper and no annoying shuffling of notes pages. A huge relief!! How exciting! Thanks for sharing this, Corinne. The treehugger in me is very happy right now. Interesting. We all keep slipping, slipping, slipping into the future. And I really liked your reference to the cat-shaped elephant in the room. I travel a good deal and found that the biggest problem with using an iPad was downloading and then accessing the file to be translated. The lack of a ‘download’ folder on the iPad was the real killer. I mainly use SmartCat, which runs pretty well in the Puffin browser (it’s not designed to – it’s intended for laptop or desktop use), presumably because Puffin which supports Flash. That’s fine if you’ve got the source file in it before you start, but when you’re done, you can’t download it to proofread! I eventually solved the problem by buying a refurbished Acer Aspire 1. It’s the same size as an iPad and cost me just under £90 on eBay. With that using the personal hotspot on my iPhone I’m able to translate anywhere I can get a mobile signal. Another thing to consider is the use of the tablet or smartphone as a dictation and transcription device in translation. 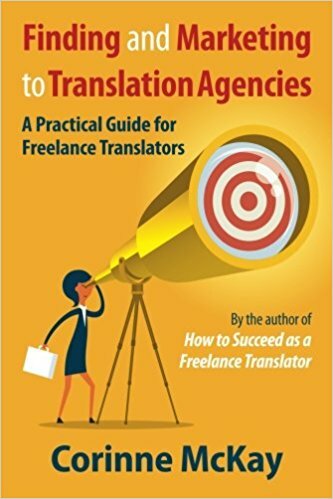 Tiago Neto’s recent article in the ATA Chronicle and mine last year discuss this, and there are a number of other examples (such as http://www.translationtribulations.com/2015/04/free-good-quality-speech-recognition.html and https://youtu.be/FKim6kvowtw). The situation will only get better with some of the interesting integrations in the works for mobile devices and major translation productivity tools. Nice to see my video is still getting some use after all this time! Interesting article. Thanks for the great post and interesting ideas. I’ve been using my tablet as a second screen for ages using AirDisplay, which works pretty well. I just wanted to draw your attention to one other web-based CAT-tool which I’ve been experimenting with lately for a large localization project: MateCAT. I gave it a quick spin on my tablet, and it seems to work smoothly as well. Amazing tips thanks for sharing. Technology is really helpful for quality translations. Being a freelance translator this blog will help me a lot in my work. Alexander, thank you very much for this bunch of ideas. I have just bought a tablet and I am sure this will help me make the most of it. I haven’t even though of using CAT-tools on a tablet before I read your post. This has turned into such an interesting discussion. Thank you for some great ideas! Since my last post I’ve been trying dictation using MS voice recognition. It has a long way to go! I’ve also discovered that Smartcat will accept files from Dropbox. Working on the iPad is still slow going though. I’m hoping CAT designers will realise soon that they’re missing a trick and hone their code to make their software more tablet-friendly!